In the Last Frontier, everything appears on a much bigger scale. So it’s no surprise Alaska can stake claim to one of the largest bore tides in the world. The Turnagain Arm bore tide occurs in the shallow stretch of Cook Inlet, seen from the Seward Highway south of Anchorage. When incoming tides clash with the flow of outgoing tides, a large wall of seawater, sometimes up to 10 feet tall, rushes into the inlet at a speed of 10 to 15 miles per hour. It’s the only bore tide that occurs in the far north and also offers dramatic scenery; mountains tower over the inlet and wildlife viewing is often at its best right after a bore tide occurs. Not only is this rare, natural display a sight for tourists and locals, it also attracts many thrill-seekers. Scott Dickerson, a well-known Alaska surf pioneer who has sought out the biggest and best waves along the state’s thousands of miles of coastline, has frequently made the long drive from his hometown of Homer, Alaska, to ride the bore tide up Turnagain Arm. In the early spring and through the summer, on only a few days every month, surfers can spend more than half an hour riding the bore tide wave in the frigid waters of Cook Inlet. Dickerson’s record is fifty minutes, riding a total of five miles. When the conditions are favorable, there can be as many as 30 or 40 people out trying to catch the wave — a number much larger than the handful of adventure-seekers who surfed the bore tide when Dickerson was a beginner about 15 years ago. But despite the most promising conditions, it’s hard to predict what Mother Nature will do. In the world of Alaska surfing, the bore tide isn’t known as the best wave to surf but it is the only wave to surf within a three-hour drive from Anchorage. The water is cold and murky, full of fine glacier silt. “It’s still fun because it’s such a strange thing. We’re not doing it because it’s the best wave in the world, but it’s always really interesting and fascinating. It’s different every time,” Dickerson said. 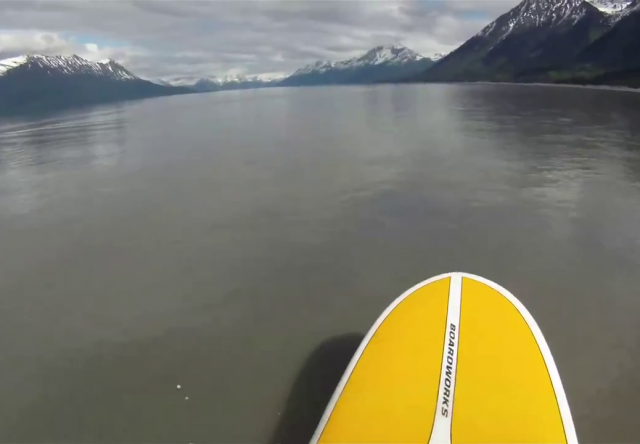 Surfers are not the only ones on the water taking advantage of Alaska’s extreme playground. When a bore tide is expected, you can find many kiteboarders and paddleboarders out there as well, hoping to catch the wave. It creates quite the spectacle for drivers along the Seward Highway, who often pull over to watch. And why not? The bore tide is an incredible sight, set against an already spectacular Alaska backdrop.